Suboleski, John L., 90, Cambria City, passed away December 24, 2017 at Memorial Medical Center. Born November 8, 1927 in Johnstown, son of the late Leon and Catherine (Helo) Suboleski. Preceded in death by wife, Mary Louise (Holtzman) Suboleski; brothers, Stanley and Joseph; and sisters, Catherine, Blanche, Mary, Ann and Julia. Survived by loving daughters, Jean married to Dave Wainwright, Cambria City; and Joan Pennline, The Villages, Fla.; grandchildren, Adam, Jonathan married to Kathleen, Steven and girlfriend Brittany, Jeffrey, Gregory married to Amy, and Nicholas; also by numerous nieces and nephews. John was the last surviving member of his immediate family. John was a retired truck driver for over 60 years, he was a member of the VFW Post 155, St. Casimir’s Polski Dom, Croatian Federal Union, American Legion, and devoted life member of St. Patrick Catholic Church. He served our country in the U.S. Army during the Korean War. 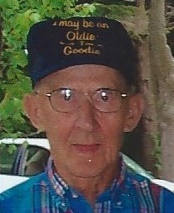 John was a graduate of the former Franklin High School class of 1946, known as the candy man at Ponderosa, and was a loving father and grandfather. Family will receive friends from 2 to 4 and 7 to 9 p.m. Thursday, Dec. 28th, at MOSKAL & KENNEDY COLONIAL FUNERAL HOME, 219 Ohio St. Johnstown, where vigil service will be held in the evening. Funeral mass will be celebrated 10:00 a.m. Friday, Dec. 29th, at St. Patrick Catholic Church, Fr. Walter Moll. Military rites will be conducted at the church. Committal will be at St. John Catholic Cemetery, Geistown. In lieu of flowers, memorial contributions may directed to St. Patrick Catholic Church, any Veteran’s Association, or the ASPCA in his memory. www.moskalandkennedyfuneralhome.com.